Rodgebrook horses is a family run business owned by Robert and Lyn Booth based on the outskirts of Newport, Isle of Wight. We have excellent modern facilities and offer a wide range of Livery, schooling and training packages. 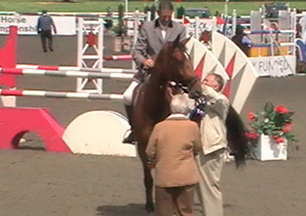 Robert has competed and trained horses for over 37 years. He has obtained his BHSI and trained with many top coaches including Jennie Loriston-Clarke and John Ledingham. Robert has competed at national level to Intermediate eventing and 1.40m show jumping. He especially enjoys producing young horses. After working at Catherston Stud he gained great experience of dressage, breaking, training, and breeding. He then moved to Ireland to work as a show jumping rider where his passion for show jumping originated, returning in 1985 to start our own business now known as Rodgebrook Horses. Robert enjoys teaching horses and riders from novice to advanced and helps them achieve their goals through correct progressive training and many of his pupils are now getting excellent results in dressage, show jumping and eventing. Many of our home produced horses have also gone on to achieve great success.